Docking stations are used to plug electronic and mobile devices into common peripherals. They are hardware that help portable devices connect to various peripheral devices. Docking stations makes device connectivity user friendly. They have multiple slots for connectors, storage devices, and peripheral devices such as printers and monitors. Portable devices are transformed and a desktop-like feel is achieved with the help of a docking station. External monitors and keyboards increase ease-of-use. Docking stations help increase the productivity of employees by guaranteeing access to all the critical devices easily with reduced wiring. Docking stations are complementing strategies such as bring your own device (BYOD) and choose your own device (CYOD). The global docking station market was valued at US$ 4,204.7 Mn in 2013 and is forecast to grow at a CAGR of 5.3% from 2014 to 2020, reaching US$ 6,018.6 Mn in 2020. Changes in the work environment have resulted in the implementation of new policies, as employees work in the field or from their homes. Employees want to access all the important devices once they come back to their office desk without experiencing wiring problems. Docking stations provide easy access to all the devices within the office environment. An increasing number of enterprises globally are implementing BYOD policies to provide flexibility to their employees and increase employee satisfaction. Major docking station providers profiled in the report include Dell, Inc., Hewlett-Packard Development Company, L.P., Samsung Electronics Co., Ltd., Toshiba Corporation, ASUSTeK Corporation Inc., Lenovo Group Limited, StarTech.Com Ltd., and Targus Group International, Inc. 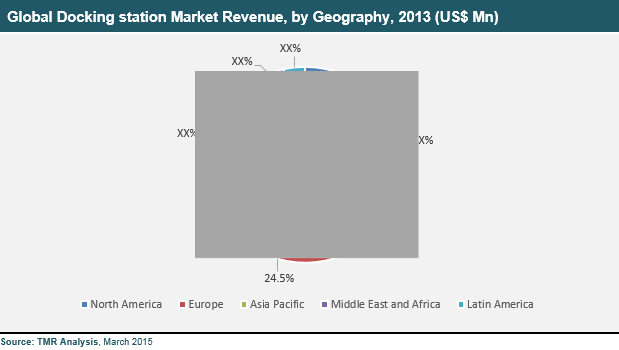 The global docking station market has been segmented on the basis of type, technology, application, and geography. On the basis of type, the market is segmented into laptop docking stations, hard drive docking stations, and mobile device docking stations. Increasing adoption of BYOD policies by enterprises worldwide is driving the docking station market. Based on technology, the docking station market is further segmented into wired docks and wireless docks. Wired docks is the major sector in the technology segment due to the low cost of purchase and superior connectivity. Also, according to application the docking station market is divided into residential and commercial segments. North America led the docking station market in 2013, accounting for approximately 45% of the global market revenue; the region is expected to remain dominant throughout the forecast period from 2014 to 2020. The primary driver of the docking station market in North America is the wide adoption from the enterprise segment. Europe and Asia Pacific are anticipated to hold promising growth for the docking station market in the future. Docking stations enable users to connect their portable devices to a set of peripherals through a simple connection. With the help of docking stations, portable devices such as laptops, hard drives, and mobile devices are connected to various peripherals such as monitors, speakers, mouse, and others without the need for multiple cables. Rising demand for smartphones, tablets, and notebooks is anticipated to generate high demand for docking stations in near future. In the past few years, several developments in the docking station market occurred including the release of wireless options. For instance, Dell Wireless Dock D5000 can connect to a keyboard, two monitors, USB devices, gigabit Ethernet, various hard drives, and others. It was the first docking station to provide wireless gigabit (WiGig), which uses the 60 GHz frequency band to allow a more powerful transmission than traditional Wi-Fi. Docking stations come in various shapes and sizes and offer the same functionality, which is to allow users to connect a portable device to a set of peripherals. Docking stations remove much of the hassle associated with connecting a device to multiple outlets. Docking stations are categorized based on product type, technology, application and geography. The market for docking station is majorly driven by its wide adoption for connecting laptops, tablets, and mobile phones. In addition, due to the proliferation of handheld devices along with the rising popularity of BYOD (Bring Your own Device) and CYOD (Choose Your Own Device) policies, the demand for docking stations is expected to increase substantially during the forecast period. The report on docking station market provides the current scenario as well as future market potential of docking stations, globally. The docking stations market has been segmented into three major product types, namely, laptop docks, hard drive docks, and mobile devices docks. The market for docking station has been extensively analyzed on the basis of technology, application, and geography. On the basis of technology, the market has been segmented into wired and wireless technology. Furthermore, on the basis of applications, the docking station market is segmented into residential and commercial segment. The market size and forecast in terms of revenue (US$ Mn) for each of these segments have been provided for the period from 2012 to 2020, considering 2012 and 2013 as the base years. The report also provides the compound annual growth rate (CAGR) for each segment of the market for forecast period from 2014 to 2020. Geographically, the market for docking station has been segmented into five regions North America, Europe, Asia Pacific, Latin America, and the Middle East and Africa (MEA). The market size and forecast for each region have been provided for the period from 2012 to 2020 along with the CAGR (%) for the forecast period 2014 to 2020. The study also includes qualitative analysis of the competitive scenario in these regions. The overview section of the report comprises qualitative analysis of the overall market highlighting the factors determining market dynamics such as drivers, restraints, and opportunities, along with market attractiveness analysis and value chain analysis. The report also provides a section on competitive landscape, wherein the market positioning of leading players in the global docking station market for 2013 has been analyzed. The report concludes with the company profiles of major players in the global docking station market such as Dell Inc., Toshiba Corporation, Hewlett-Packard Company, IBM Corporation, Lenovo Group Ltd., Samsung Electronics Co., Ltd., ASUSTeK Computer Inc., Sony Electronics Inc., and StarTech.com. The company profiles of key players in the market and the strategies adopted by them to sustain the competition. Recent developments and barriers of the market will help emerging players to design their strategies in an effective manner. The study is expected to help key players in broadcast switchers market to formulate and develop their strategies.